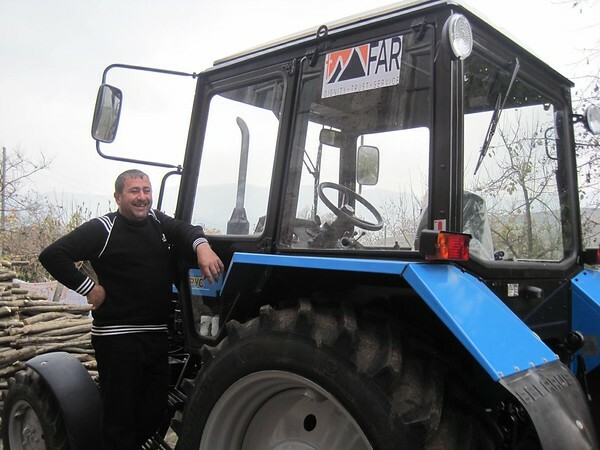 FAR’s Breaking the Cycle of Poverty Program (BCPP) is progressing in economic development with the creation of four farming cooperatives in the Berd Region of Armenia’s Tavush Province. In cooperation with the Ministry of Agriculture and Heifer International, FAR has already provided cooperatives in these border villages with much needed supplies. Chinchin and Paravakar have even started using their new Belarus tractors. Chinchin residents are also happy to have a grass-collecting machine, while the folks in Paravakar are proud of their new seed drill. Very soon the number of available vehicles will grow from four to 12 and they will be used in Tavush and Chinari villages, too. By the end of winter two more farming cooperatives will have been formed in Tsaghkavan and Varagavan villages, as well. BCPP’s green agriculture component is also moving along. Through a partnership with Sahman (or Border) NGO, new greenhouses have been provided to five families in Chinari Village. Berd city’s greenhouse owners have already collected fresh vegetables and greens in time for winter. Berd resident Manush Ghukasyan has even managed to sell some of her greens. To ensure better management of the greenhouses, FAR agronomist Hratsin Grigoryan visited the households in Berd who had their own and advised their owners on how best to tackle the challenges that come with growing during unusually cold winter weather. The other great result is that a brand new tractor made it to Berd this past summer. It has already restored 50 hectares of arable land and residents have already managed to sow wheat. The first of its kind in Armenia, the Russian Agromash tractor will further allow them to restore the city’s 300+ hectares, which have been neglected for more than 10 years.